When North meets South, it’s murder. Chicago entrepreneur, Peter Reynolds, is barely thirty and has sold his import/export business for seven million dollars. He is at loose ends, not terribly moral and more than a little spoiled to a lavish lifestyle. All that he has come to know and cherish is about to change when he gets an invitation to attend the funeral of an ex-girlfriend, Diane Cottwell, in Archer Springs, North Carolina. From the moment he steps off the plane, things take a downward spiral. Beginning with the rental car from hell, he finds himself embroiled with moonshiners, good-ole-boy politics and a sociopathic killer. When Diane’s seven-year-old son inherits the family farm, 875 acres of prime land, Peter has his hands full outsmarting conniving relatives and a greedy businessman, all with their eyes set on getting the property. And a love starved country girl and the businessman’s lustful wife offer him plenty of temptation. Diane’s death that initially looked like a home invasion gone wrong starts to look more and more like a planned murder. Then more people die and Reynolds finds himself on the trail of a ruthless killer whose next victim may be Diane’s son. 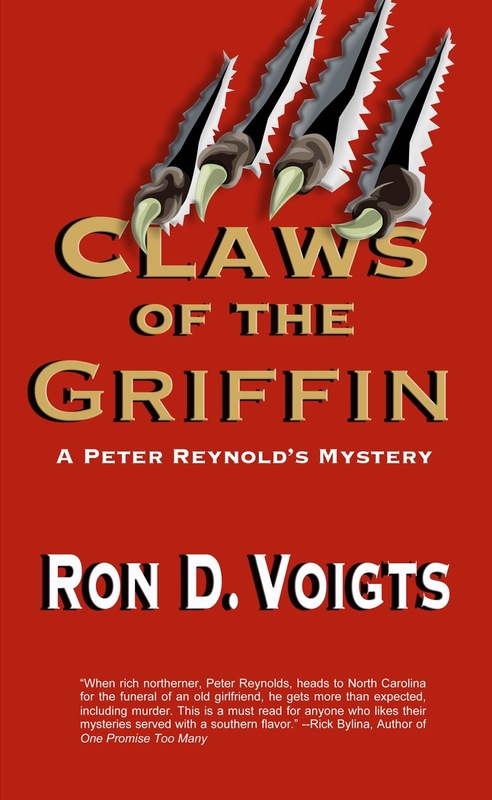 Claws of the Griffin is a roller coaster ride of mystery, mayhem and murder, Southern style. Available in the Spring of 2013 from Cool Well Press. 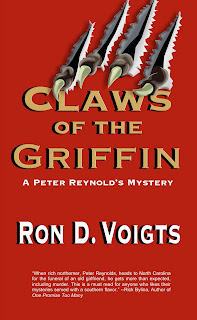 Ron D. Voigts also writes the Penelope Mysteries available from Amazon and Barnes & Noble.